Mary Kate loved attending Our Lady of Perpetual Chastity – the all-girls Catholic school in Waukesha, WI. Mary Kate is a staunch feminist and defender of social justice, and her biggest role models are the nuns who have taught her to be strong and independent. 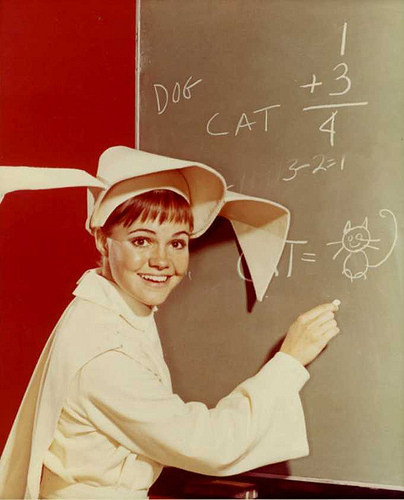 When the nuns announced that the school would become a co-ed charter school, Mary Kate was crushed. As an example of her contrary tendencies, she had complained endlessly about the Catholic school uniforms when she had to wear them, but once the school went secular and coed, she started wearing her old uniform rolled up into a miniskirt to show her solidarity with the nuns. She comes from a large Catholic family and has six brothers and sisters. She’s a middle child, and can feel lost in the crowd, so she has developed a loud voice and a passion to find ways to set herself apart. Her drive to do what others aren’t led her to pre-calculus, where she’s decided to fight the stereotype that girls can’t do math. Mary Kate wants to focus on achieving all she can and getting noticed by her family, but she sometimes gets sidetracked by a secret streak of boy-craziness. In particular, as much as she might deny it, she has her eyes on LeRoy, the new boy in school. 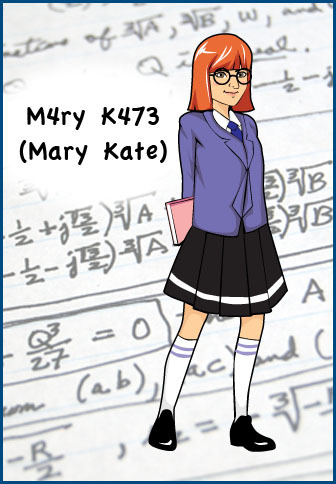 Mary Kate wanted to distinguish herself by being voted captain of the Math Team, and was disappointed when the team instead chose Melissa (the nerdy girl with crazy hair). Most of all, Mary Kate dreams of getting out of ho-hum Waukesha to the grittier, exciting energy of a big city. If the Math Team can only make it to National Math Challenge, finally she can get a taste of New York! Will Mary Kate’s secret streak be exposed? Will her drive for independence get in the way of being a trusted team mate? And will she ever get tired of wearing Catholic School uniform mini-skirts? Find out in NUMBERS N3RDS, the musical.